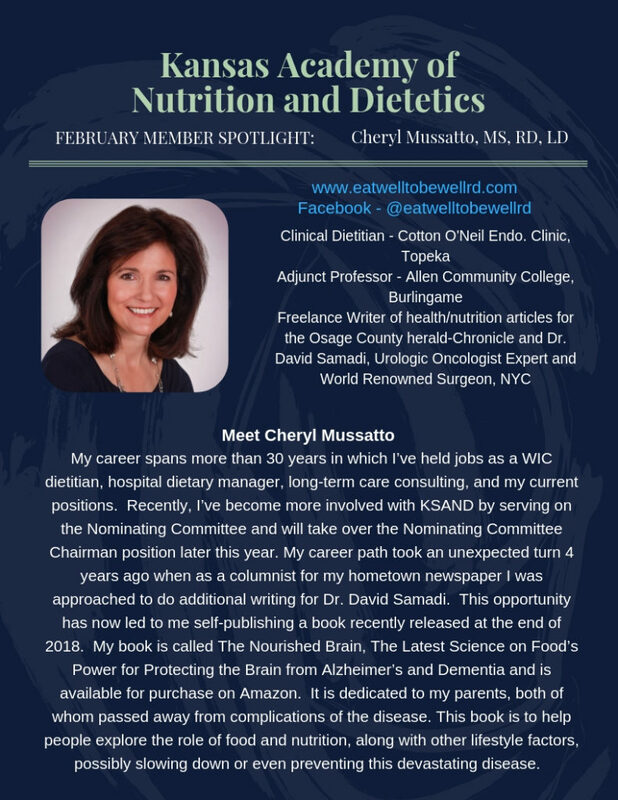 Registered dietitian nutritionists, or RDNs, are the food and nutrition experts, translating the science of nutrition into practical solutions for healthy living. The expertise, training and credentials that back a registered dietitian nutritionist are vital for promoting positive lifestyle choices. Registered dietitians draw on their experience to develop a personalized nutrition plan for individuals of all ages. They are able to separate facts from fads and translate nutritional science into information you can use. A registered dietitian can put you on the path to a healthy weight, eating healthfully and reducing your risk of chronic disease. Check out these KSAND Member Spotlights! Please contact the Membership Chair, Isabelle Bouchard, at membership@eatrightks.org to be featured in a following month.